Based in Guangzhou, China, ChinaSavvy’s industrial division handles all types of manufacturing processes and works with a number of materials to deliver a high quality product. Our metal fabrication capabilities allows us to work with a number of mild steels, stainless steels, aluminum sheet and profiles, as well as a number of other special alloys. Within fabrication, ChinaSavvy specializes in aluminum fabrication as well as stainless steel fabrication. Also a leading mining engineering company specializing in the production of mining equipment, our team applies a number of casting and metal fabrication processes to manufacture a range of mining equipment, including support equipment, standard mining equipment as well as once off specialized pieces. 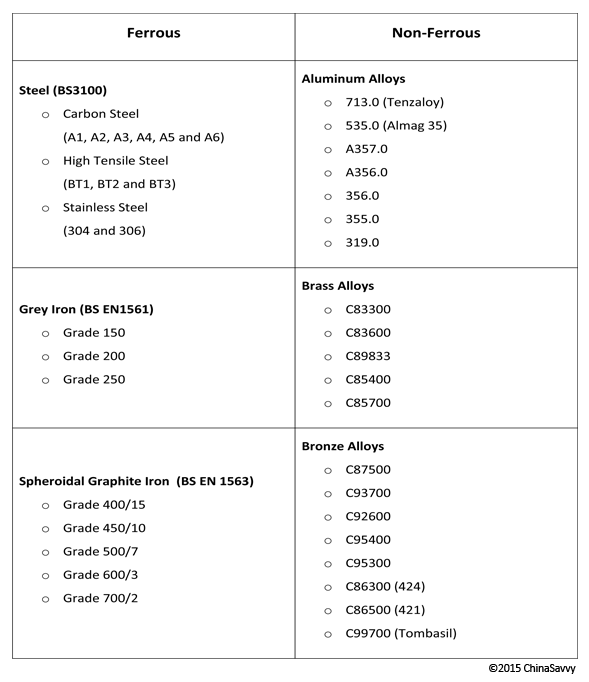 Working with austenitic, martensitic and ferritic grades of stainless steel, ChinaSavvy delivers a number of high quality services that include stainless steel tube fabrication as well as TIG Welding. In terms of stainless steel finishes, we deliver everything from standard milled finishes and mechanically polished and brushes surfaces, to organic coatings and bead blasted finishes. Capable of delivering Western quality products at affordable prices, ChinaSavvy specializes in precision CNC machining as well as custom CNC machining services. Working with a number of materials, our team delivers both small and large volume machined parts. ChinaSavvy employs three types of machines, each offering its own set of benefits to the manufacturing process in terms of cost and quality. Working with mild steel, alloy steel, stainless steel and bronze, ChinaSavvy offers investment casting services including hollow investment castings. Generally speaking, all types of ferrous and non-ferrous metals can be used as a lost foam casting material. Do note however that pouring temperatures of above 1 000°F is required as the foam pattern used must ‘dissolve’ so that the casting can be produced. Some of the more commonly cast metals in lost foam casting include aluminum alloys, steels, nickel alloys and cast irons, while the less frequently used materials include stainless steel and copper alloys. In die casting, four alloys are popularly used. 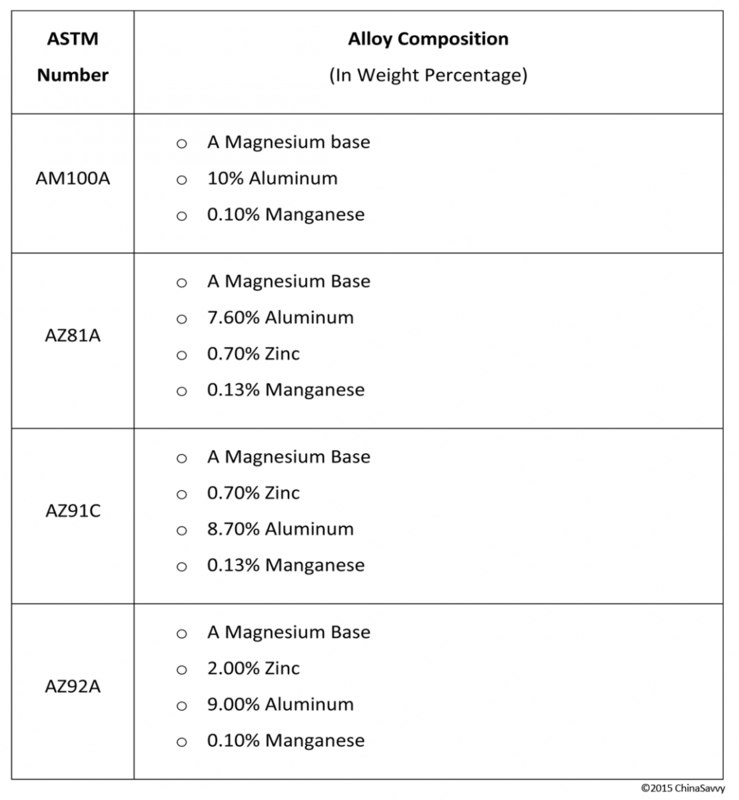 These alloys include aluminum, magnesium, zinc and brass. Aside from being lightweight and relatively easy to cast, aluminum alloys also offer a number of other beneficial properties. Some of these properties include a good resistance to corrosion, a high thermal and electrical conductivity, a low density and high dimensional stability, as well as a good strength and stiffness to weight ratio. 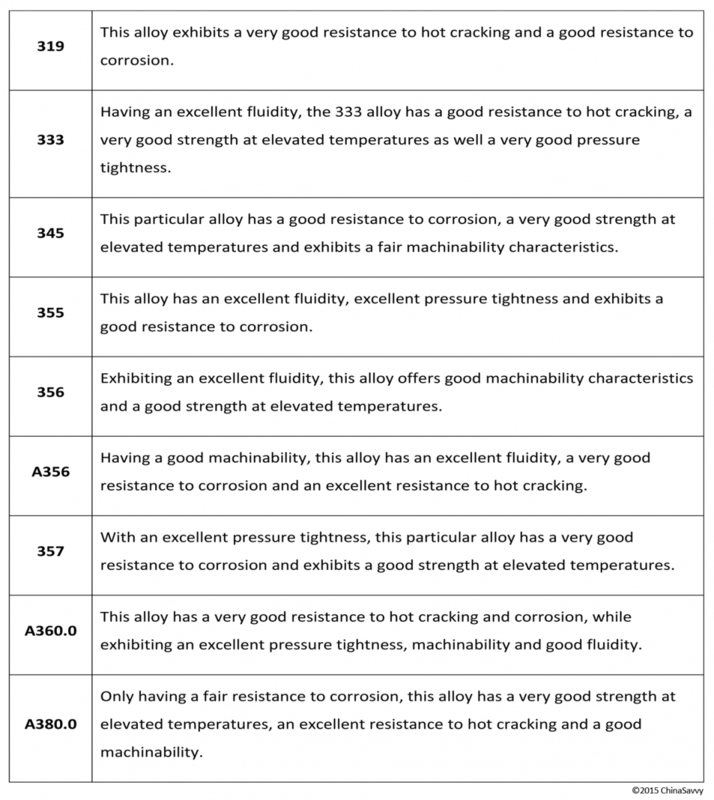 Learn more about aluminum alloys used in die casting. Almost lighter than plastic and suitable for use in both cold and hot chamber machines, magnesium offers it own set of beneficial characteristics. Some of these characteristics include a very low density, a high strength to weight ratio, good finishing characteristics, as well as a high thermal and electrical conductivity. Learn more about magnesium used in die casting. Zinc, one of the easiest alloys to die cast, offers a better alternative to machined, fabricated and pressed parts in terms of cost. Aside from having a low melting point which effectively helps to prolong die life, zinc also offers other beneficial characteristics including a high hardness and strength, the ability to form very thin walls, a high dimensional stability and accuracy, as well as a good impact strength. Learn more about zinc used in die casting. Spark resistant, brass is an aesthetically pleasing alloy and offers a number of beneficial characteristics ranging from a fair dimensional accuracy to an excellent resistance to corrosion. With a high electrical conductivity, the finishing characteristics for brass are excellent for mechanical finishing processes, chrome plating and black chrome plating. Learn more about brass alloys used in die casting. Using a powdered metal in the molding process, these powders should have, among other characteristics, a predominantly spherical shape, no agglomeration, dense and free of internal voids and small in particle size in order to aid in the rapid sintering process. Learn more about the materials used in injection molding. Working with a variety of metal alloys, ChinaSavvy’s capabilities include producing magnesium, copper and aluminum permanent mold castings. *Note: You can click on the table to view a larger image. 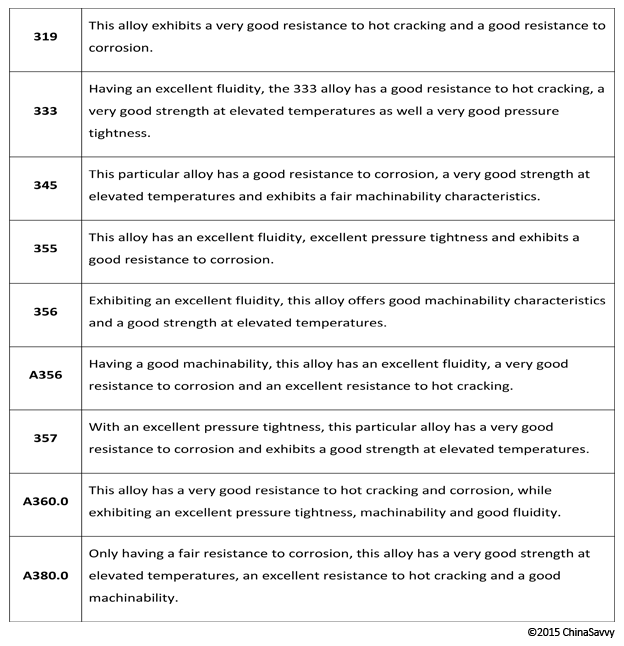 Learn more about aluminum alloys used in permanent mold gravity casting. Engineering Alloys: This group includes nickel silvers, silicon brasses and aluminum bronzes. High Conductivity Coppers: Used for electrical components, these coppers are susceptible to oxygen pickup and have high melting points. Yellow Brasses: More specifically C85500, C85800 and B-2, these yellow brasses are the most widely used copper based alloys in Europe and the United States for decorative items such as faucets. Learn more about copper based alloys used in permanent mold gravity casting. Learn more about metals that can be sand casted. A highly specialized sintered metal manufacturer, ChinaSavvy’s capabilities include the use of a great number of sintering powders to produce sintered parts and components that meet Western quality standards. Learn more the materials used in metal sintering. A highly recognized aluminum extrusion supplier active within the industry today, ChinaSavvy works with various grades of aluminum when it comes to extrusions. 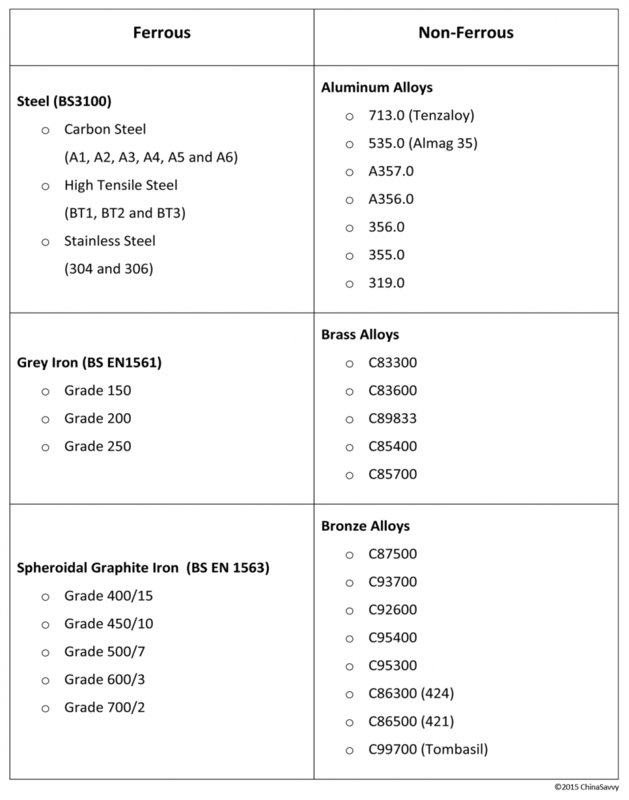 These grades include the 1000 Series, 6000 Series and 7000 Series aluminum grades. Note that the 7000 Series alloys are not as resistant to corrosion or as formable as the 6000 Series alloys. 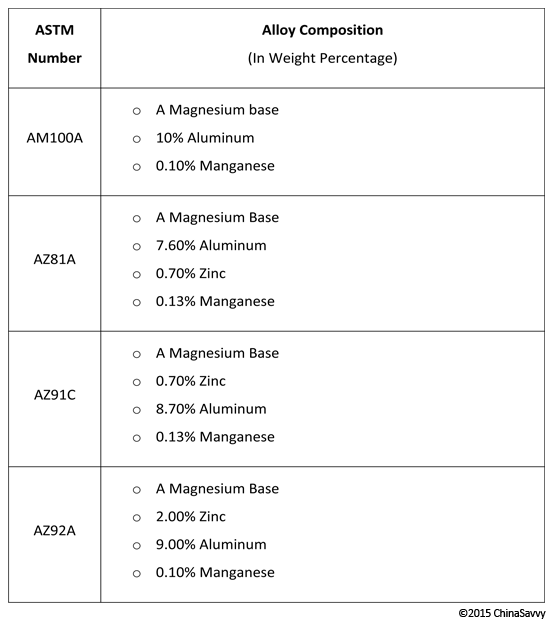 Learn more about the aluminum grades used in extrusion.